August 2, 2018. East Rosebud Creek from its source in the Absaroka-Beartooth Wilderness downstream to East Rosebud Lake, including the stream reach between Twin Outlets Lake and Fossil Lake, and from immediately below, but not including, the outlet of East Rosebud Lake downstream to the Custer Gallatin National Forest boundary. Wild — 13.0 miles; Recreational — 7.0 miles; Total — 20.0 miles. Originating high on the Beartooth Plateau from its headwaters at Fossil Lake, East Rosebud Creek flows through the Absaroka-Beartooth Wilderness to East Rosebud Lake. The designation picks up again at the lake’s outlet, continuing on another seven miles to the Custer Gallatin National Forest boundary. Although the wild & scenic river designation ends at the lake’s upper reaches, the creek eventually flows to Montana’s high prairie, where it joins the Yellowstone River. The valley’s rugged beauty alone is worthy of designation, but East Rosebud Creek is also known for its recreational opportunities, geologic treasures, outstanding fishery, bountiful wildlife and rich history. The valley is home to nesting eagles, mountain goats, bighorn sheep, black and grizzly bears, moose, Rocky Mountain elk, mountain lions, foxes, whitetail and mule deer, wolves and rare, elusive wolverines. Crystal clear waters support brown, rainbow and brook trout, as well as native mountain whitefish and Yellowstone cutthroat trout. The creek has drawn people for thousands of years. Evidence of Native Americans' long use of the area can be seen from the arrowheads, stone tools, fire rings and other artifacts found there—but please respect its history and leave these artifacts for others to enjoy. Today, hikers visit via the well-known and aptly named Beaten Path backpacking route, but this is just one of several opportunities to experience the Absaroka-Beartooth Wilderness. The area is famous for classic Montana flyfishing opportunities. Whitewater boating adds another way to experience the creek. For those visiting for the view, the creek flows through a remarkable country of granite cliffs, talus slopes, glacially scoured valleys, wildflower-strewn meadows and other alpine scenery. 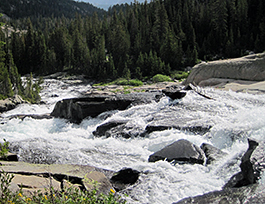 The creek itself is a string of riffles, small rapids and spectacular cascades, such as Impasse Falls. In the fall, the bright autumn colors of deciduous trees contrast with the slopes and the snow-capped peaks.